Namizato Youth Eisa Group performing around a hatagashira pole. 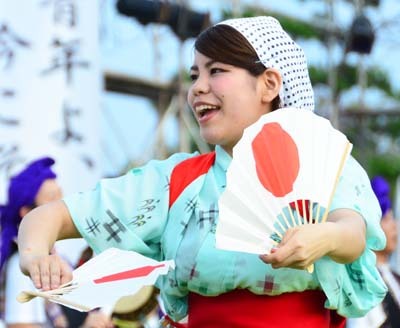 The exact origins of Eisa are unknown but the performing art form was definitely born on Okinawa, as it does not exist anywhere else. In modern times Eisa developed into a form of entertainment that groups of young men and women perform at almost any festive occasion. 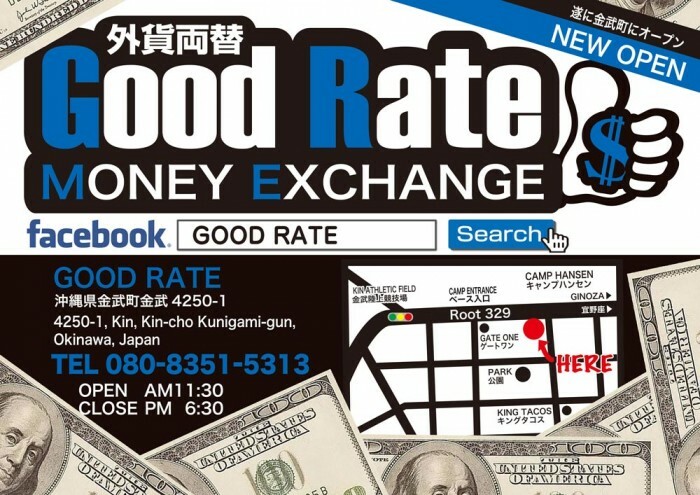 It has also become a major form of entertainment in the booming tourism industry. Many start Eisa from young age. Eisa first took root in communities in the middle part of Okinawa in the Meiji-era, where newly organized youth groups included Eisa in their programs. 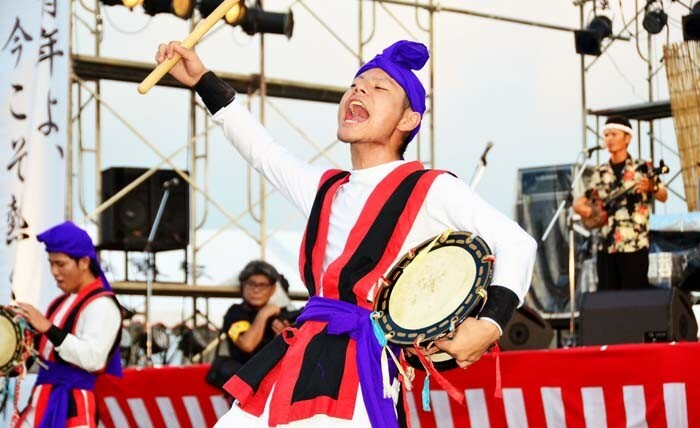 Currently, youth club based Eisa groups emphasize the traditions, while the Eisa club teams perform often with adapting modern Okinawan pop songs, mixing male and female performers in the team, and adapting fancy and physically demanding moves into their performance. 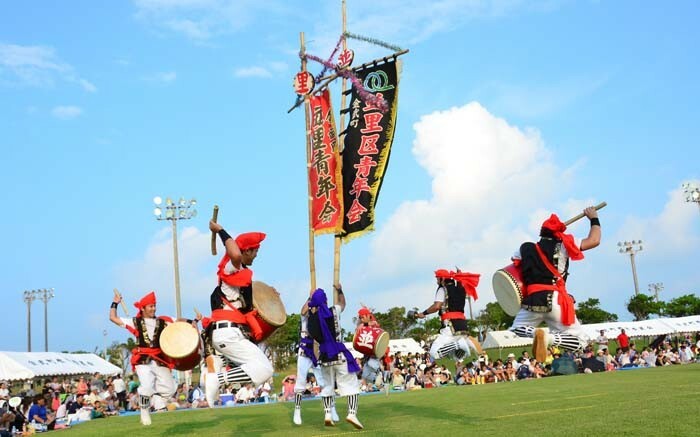 There are several Eisa festivals on Okinawa on weekends throughout the latter part of the summer and all are free to attend. 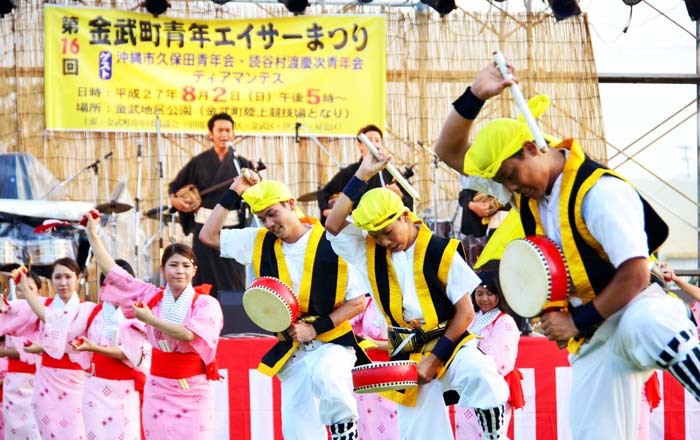 One such event is the 17th Kin Town Eisa Festival that takes place at Kin Park this Sunday. In the case of inclement weather, the festival will take place a week later on Aug. 14. Five youth Eisa groups are scheduled to perform at the event with the first group starting at 18:30. The festival grounds will open 30 minutes earlier. Each group performs about 30 minutes, and the event concludes with a Kachashi dance, in which everyone is invited to join. A fireworks show at 21:30 ends the event. Besides at the park, there’s extra parking available at the Ryukyu Rehabilitation Academy grounds that is about 10-minute walk from the festival venue. Dancer from Igei gives his all. Some Eisa characters are scary. 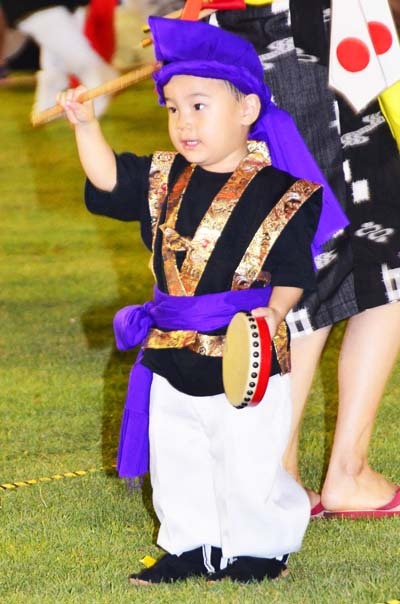 Nakagawa Youth Association Eisa group showcases their best moves.